Christmas decorations have all but disappeared from my home. Just our plain old house with the regular 365 day a year furnishings. None of the decorations of a glorious month of celebration remain. Packed once more into plastic totes in the garage. Awaiting their return to the attic. Until next December. No garland. Lighted & strung with ribbons of red & gold. No Nativities. Reminding us always of God's love through Jesus. No tree. 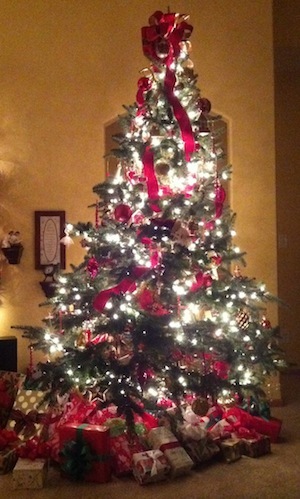 Live Frasier Fir covered with heirlooms & history, whimsy & joy. It makes these January days seem colder still. Emptier. Less colorful. Even Scroogey. The decor of Christmas - beautiful reminders of wonder - is gone 'til next year. But there is one place you can go in my home & still know Christmas. Not where you might expect. Out of the way. And just for a while. The storage closet. At the bottom of the basement stairs. It smells like Christmas. Our vacuum resides there. It's bag filled with fallen fir needles. Aromatic indeed. A reminder of Christmas. As you launch into a new year - full of dreams & hopes, promises & resolutions - is your life a reminder of Christmas? Year-round - not just one shinning month - does the world see the Savior in you? Do they hear his grace in your speech? Do they see his forgiveness in your eyes? Do they receive his gifts from your hands? Do they receive his life through yours? Does your life smell like Christmas?